The complete structure determination of a polypeptide in a lipid bilayer environment is demonstrated built solely upon orientational constraints derived from solid-state NMR observations. Such constraints are obtained from isotopically labeled samples uniformly aligned with respect to the B0 field. Each observation constrains the molecular frame with respect to B0 and the bilayer normal, which are arranged to be parallel. These constraints are not only very precise (a few tenths of a degree), but also very accurate. This is clearly demonstrated as the back bone structure is assembled sequentially and the i to i+6 hydrogen bonds in this structure of the gramicidin channel are shown on average to be within 0.5 Å of ideal geometry. Similarly, the side chains are assembled independently and in a radial direction from the backbone. The lack of considerable atomic overlap between side chains also demonstrates the accuracy of the constraints. 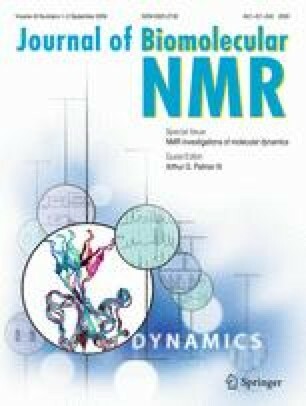 Through this complete structure, solid-state NMR is demonstrated as an approach for determining three-dimensional macromolecular structure.